There was snow on Mount Washington on Mother’s Day. More than 30 inches of snow enveloped Mount Washington Observatory this weekend — just days before parts of Massachusetts are expected to have temperatures in the 90s. 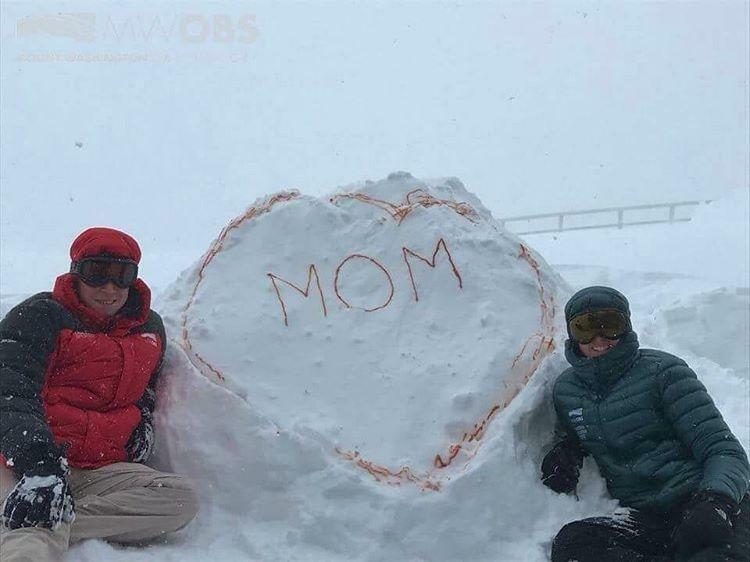 The snow started Saturday night at the New Hampshire observatory and continued through Monday, covering the mountain with about 33 inches before stopping, according to a Facebook post from the observatory. A May snowfall is not unusual at the observatory, said Chris Kimble, a National Weather Service meteorologist. About 12 inches of snow typically falls in May at the observatory, which has an altitude of 6,300 feet. But this weekend’s storm broke a couple weather records, including the largest snowfall for a single day in May. “In 1967, 22.2 inches fell, and this weekend we got 22.9 and counting,” Kimble said. The record for the largest single-storm snow in May was also broken, he said. From May 21 to 24, 1997, the observatory was hit with 30.6 inches of snow. This weekend, 33.3 inches fell. So far, over 45 inches of snow have fallen at the observatory this month. Despite having more than three times the average snowfall, this month falls short of being the snowiest May ever at the observatory, Kimble said. “The most they’ve had (in May) is 95.8 inches, so we’re at just about half,” said Kimble. Other areas in New Hampshire also got snow, but not as much — from 3 to 9 inches, he said. The cause of this sudden snowstorm is a lingering low pressure system that has kept the area cool. “It wasn’t until this latest nor’easter that it all came down. Just the right combination of snow and moisture,” said Kimble. Even as the observatory gets ready to dig itself out, Massachusetts is expected to see temperatures in the high 80s and low 90s by Thursday, according to the National Weather Service. Such heat in May is “somewhat unusual, but not out of the ordinary,” said meteorologist Frank Nocera. “In May, you often get tastes of either two or even three seasons. The average for this time of year is 71 degrees. On Monday, it was 51 and on Thursday it could be 91. So a 20-degree shift is drastic, but not uncommon,” said Nocera. The shifts in temperature are caused by how ocean currents allow either hot or cold air to hit the region, Nocera said.